Some folks draw thr line at the King James Bible; others at the style of baptism or tithing or personal faith and still others at being “born again”. 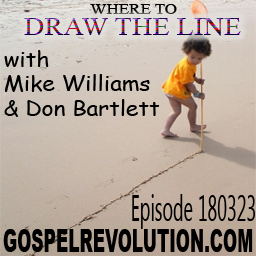 But where does GOD draw the line? Reading the Bible logically in context, Here the answer becomes perfectly clear. Contributors include Danny Minaskanians, Vic d’Obrenan, Phil Brittan, Kenneth and Adrianne. In this podcast, Mike and Don also address life after death, the wages of sin versus the gift of eternal life, and how we are God in the earth, Enjoy listening. “The Christian Line” is impossible to define but for Christians only, I’d say if you do not go into all the world and save lost souls, forget your salvation. How many should they save? Everyone they can I guess. Any Christians saving even 10 souls a year? If I were a Christian I could not ignore the great commission to save lost souls nor could I rest assured that I myself have met those Christian requirements. I’m tickled silly that Jesus crossed the line for me.